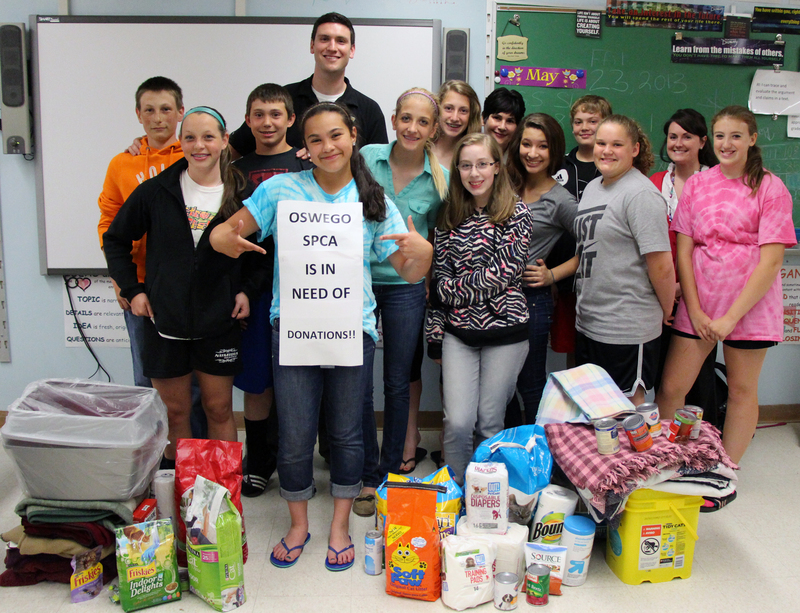 The Fulton Junior High School’s Friends of Rachel (FOR) club recently collected much-needed items for the Oswego County SPCA and their four-legged friends. Fulton Junior High School’s Friends of Rachel club members with their donations to a local animal shelter. Some of the members are pictured here with the donations that included kitty litter, food, toys, blankets and other supplies for dogs and cats at the local animal shelter. The FOR group was organized at the junior high last fall when students at the school pledged to continue to build a chain reaction of kindness and compassion following a visit to their school by Rachel’s Challenge. Rachel Joy Scott was the first person killed during the Columbine High School shooting, and her father began sharing Rachel’s message of kindness and compassion following her death with a powerful program called Rachel’s Challenge. The FOR club has completed several in-school and community-wide service projects that illustrate their commitment to spread kindness and compassion; including this one for their four-legged friends at the SPCA.